People need to get around. That’s not going to change. If anything, as people become more affluent, the demand for mobility grows. But a new report by the Munich-based financial services giant Allianz gathers data that shows evolving consumer attitudes and behavior toward cars are changing at an unprecedented pace. And that’s leading to a whole new landscape of ways for people to meet that need for mobility without getting into a personal auto. The numbers show that – in Europe and North America, at least – fewer cars are being sold and registered than in years past. In a growing number of rich countries, the number of miles driven is flattening out or even dropping. In the US, the Pacific Northwest is leading the trend. In fact, in Washington state, there was less traffic on the roads last year than at any time since 2002. Rising costs – The report notes the price of gasoline in Germany has risen 30% since 2005. In the US, it’s more than 50%. Over the past 15 years, the cost of gas has nearly quadrupled. And while the price of petroleum-based fuels may fluctuate in the short term, the cost of gas and diesel will only continue to go up as oil grows more scarce and expensive to extract. The report says this is increasingly becoming a reason not to drive, especially among younger consumers. (As gas prices approached a then-record of $3.00 per gallon in 2007, transit buses in the Seattle area displayed ads that taunted, “Gas doesn’t cost anything if you don’t buy any”). Congestion pricing in London and several other cities is also discouraging urban driving. Innovative business models – Over the past decade, the use of car sharing services has exploded in the US and Europe. Using new web and mobile technologies, companies such as Zipcar, Car2Go, Lyft and a growing number of others now offer a variety of affordable ways to get temporary wheels. John Williams, the PR guy for Zipcar in Seattle, recently told me that “there’s a compelling argument to make that having the ability to access a car when needed, without having to own one full time, gives consumers the option to rely less on a car.” Trends toward e-commerce, home delivery and telecommuting are contributing to reduced demand for driving, as well. Environmental regulations and consciousness – Climate change is making itself increasingly felt in extreme weather events and people are becoming more aware of the need to reduce their carbon footprint. Transit usage, cycling and walking are all on the rise, often fueled by environmental concerns and values. At the same time, governments are placing more restrictions and demands on auto emissions, fuel efficiency and recycle-ability. These contribute to making car ownership more expensive and less convenient and make alternatives more attractive. Changing demographics – As the baby boom generation ages, they drive less. And the following generations are not only smaller; they’re more inclined to live in denser urban centers with other mobility options, more sensitive to the rising costs of driving and more likely to cite environmental reasons to reduce car use. Increasingly, young people are prone to see car ownership as a burden rather than as a status symbol or a prerogative of adulthood, as previous generations did. New technologies – Clark Williams-Derry, an analyst with the Seattle-based Sightline Institute, points to a variety of mobile technology tools that make using buses and other public transit more convenient and enjoyable. From checking your e-mail or scanning the web on your smartphone while on a train to being able to pinpoint the location of your bus and its arrival time, he says, transit is becoming a more attractive commuting option for many. The Allianz report also notes that the ubiquity of smartphones has fueled the rapid growth of car sharing services, many of which rely on mobile telecom technologies. The widespread use of the internet, as well, serves for many as a way of shopping, communicating and socializing without leaving home. It’s too early to put the car in its grave just yet. While trends in the rich countries point toward decline, emerging economies such as China and India are growing their car population at a dizzying pace. China alone registered well over 16 million cars in 2011 and India’s car industry is the second-fastest growing in the world. Still, there are signs that even these countries are starting to run into the same limiting factors as richer ones. Cars are a major contributor to the worsening air pollution – not to mention the crushing traffic congestion – that is making Beijing and other Chinese cities borderline unlivable. Last year, the Beijing government put a cap on new car registrations. Skyrocketing demand for oil from the rapidly industrializing countries is pushing fuel prices higher, even as production reaches record levels in the US, Russia, Saudi Arabia and other major producers. And let’s not forget that, no matter how cleverly we invent new ways to find and access oil, it’s still a fossil fuel. The planet will eventually, inevitably, run out of dead dinosaurs, and all the more quickly as poor countries scramble to catch up with western levels of affluence. The planet simply cannot support 7 billion people using traditional North American driving habits. 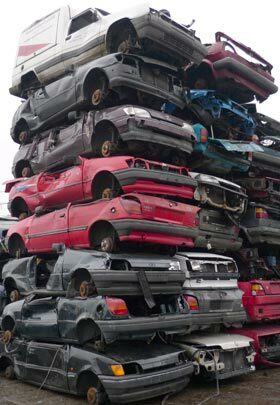 So let’s take some comfort in signs that, while Carmageddon may not yet be nigh, it seems that automobiles are on their way to becoming a relic of a bygone era of heedless consumption and environmental irresponsibility. Great post, and couldn’t agree more. That said, I have to admit that our car remains essential – we live 10 km from any services and even if I was feeling young & fit enough to try to do everything by bicycle, our little island paradise (Gabriola) has narrow roads with blind curves and hllls that make for dangerous biking, no sidewalks, street lights or any such citified touches. We try to use our car as little as possible though: 5 or 6 days of the week, it just sits in our driveway, and we group all our “village” tasks together in one weekly trip as much as possible. Laurie, I’m intrigued by Gabriola’s attempt at public transit, island style. Commercial efforts on similar islands in the San Juans haven’t fared well; not sufficient demand to run it frequently enough to be a convenient alternative to the island beater car. I’ll be interested to see how that works out!